Today, the odds of a small business actually receiving a bank loan are about 50-50, according to a recent Pepperdine Private Capital Index Survey. This has opened doors for alternative lenders, which don't require business owners to have flawless credit or go through months of red tape. They often look beyond credit history and factor in other indicators of business health, like transactions and revenue. While they still provide just a fraction of the funds of traditional lenders -- several billion compared to hundreds of billions -- non-bank financial providers have grown 100% since last year, according to Bill Phelan, president of PayNet, a small business credit ratings company. Alternative lenders offer quicker turnarounds and more personalization, but they also come with significantly higher interest rates. And because financing amounts tend to be much smaller than those offered by traditional banks -- and for shorter terms -- it can lead to an endless cycle of loans. "Small business owners need to carefully evaluate lending options and understand that not all lenders are created equal," said small business adviser Mike Periu. "It's up to the borrower to do their homework." Working capital loans: Short-term loans for day-to-day financing needs. Interest rates tend to fluctuate depending on the term length and one's business risk. But experts warn that the annual percentage rate canrun as high as 170%. Manny Skevofilax of Portal CFO Consulting said if a company needs temporary funds, the first question to ask is "why"? "You have to be looking at [options] before the jam happens," Skevofilax said. "If you know ahead of time what's causing the problems in your business, it would mitigate you having to go out and take a loan." 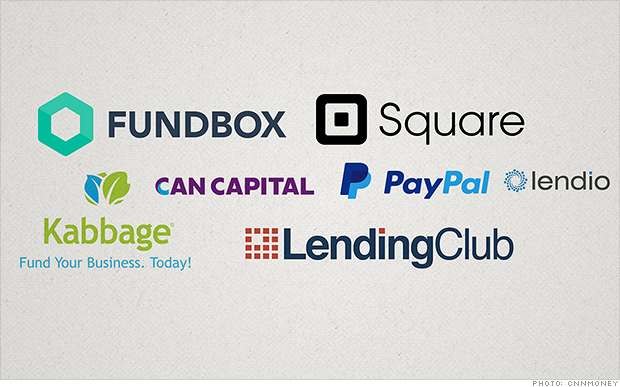 A platform like Lending Club ranks small businesses 'A' (low-risk) through 'G' (high risk). Many investors choose to auto-invest their dollars in businesses with the lowest risk. These options tend to be transparent about fees and interest rates, but Mitchell Weiss, adjunct finance professor at the University of Hartford, said borrowers need to be fully aware of all terms and conditions. "Focus on the default and remedies clauses," advised Weiss. "If you miss a payment, do you have an opportunity to remedy it?" Merchant cash advance: Business owners essentially borrow money from themselves (from revenue they've yet to receive) and pay it back in small daily remittances, plus a flat fee.Companies like Square and PayPal offer these to merchants that use their payment systems. "Merchant advance is the financial equivalent of crack," said Weiss. "When used repeatedly, these arrangements can seriously erode profitability. It's important for business owners to determine why this type of financing has become necessary." The advances are typically smaller than a bank loan (CAN Capital, for instance, offers anywhere from $5,000 to $150,000), so business owners take them out more frequently, tacking on an additional fee each time. Weiss recommends calculating the annual percentage rate using a calculator like eFunda's. "The first choice would be to see if you can find some bank financing -- that tends to be the cheapest," said Skevofilax. "But you need to be in business for at least two years." He didn't even attempt the bank. Instead, he turned to Lendio, a broker between loan providers and small business owners, which helped him get a $12,000 working capital loan from OnDeck. He's been paying back daily amounts of about $75. By September, he will have successfully paid back a total of $14,250. He paid a 19% markup for the funds. For some owners, that wouldn't be worth it if future sales don't increase. But for Davis, getting the funding in May enabled him to purchase more freezers and add more storage space. He estimates a 40% increase in sales at his two store locations and a 20% increase in his wholesale sales. "Prior to this, we would probably [have] run out of the product to sell," he said. Previous:Is AWS cloud security really out of your hands?